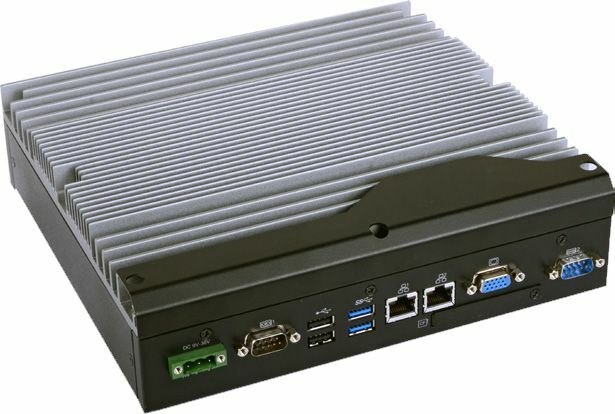 Equipped with a range of 6th generation Skylake Intel processors including Core i7-6700TE, the ECD500 is suited to a broad range of demanding industrial applications. The aluminium-encased unit measures just 235mm x 63.2mm x 221mm, operates from a single 9-36v supply and may be wall mounted or free standing. It is verified for use with Windows 10, including Windows 10 IoT, as well as Windows / WES 7, Windows 8 and Linux. A broad range of interface options are available with up to 6 USB 2.0 / 3.0 ports, triple display support, including 4K via HDMI or DP, dual Gigabit LAN and two mini-PCIe expansion ports for mSATA, Wi-Fi, 3G, as well as 2.5″ SATA drive bay and CFast port. For further details and pricing, please contact our knowledgeable team. As a Windows Embedded Gold Partner, we can also advise and train you on Windows Embedded OS, and create custom images as required.